UK Stampin' Up! 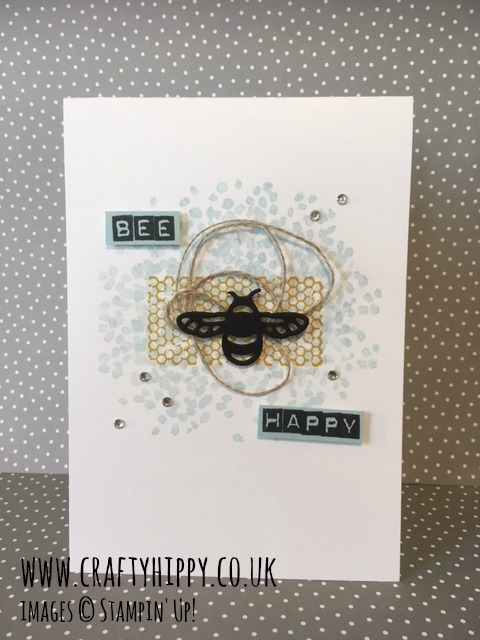 Demonstrator | make beautiful cards | Crafty Hippy: Bee Happy! Little Hippy has come to stay! It's still the Easter Holidays for us - Mr Hippy and I have three children between us and the school holidays have entered a third week as two counties have overlapped... this week Little Hippy has come to stay! So this blog may be quiet on and off until the weekend. I think today we are going to the zoo. Now anyone that knows me will know I love animals and I don't do zoos - not advocating animals for entertainment - but the zoo we are going to has rescued many of the animals and has done a huge amount of work for conservation and education, so I am going to go with the flow and hope Little Hippy learns a lot today. Today I chose to share a bright and cheerful project to celebrate our time with Little Hippy. I call this my Bee Happy Card and was something I threw together. I'm really happy with it! I shall list all the products you need to make this card. I'll be back tomorrow with news of what we got up to. Enjoy your day whatever you are doing.